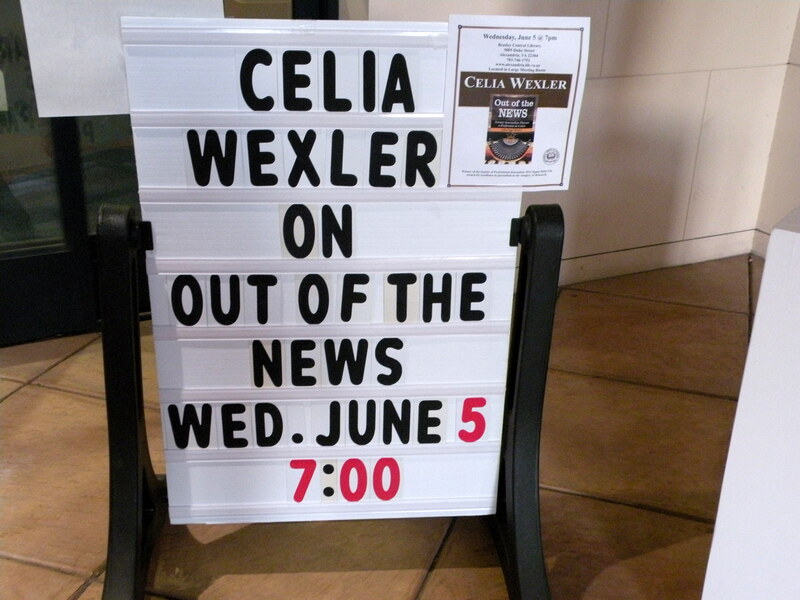 I am proud to loan this space to guest blogger Valerie Wexler! As the Boston bombing suspects led police on what would become a citywide manhunt, word spread first via the internet, but national and cable news quickly caught up. Tuesday night, a story less violent but equally riveting (and one that could affect the lives of millions of Texan women) unfolded on the floor of the Texas State Senate. That story also attracted widespread attention on the internet but it was not picked up by one cable news channel. Instead more than 180,000 people watched one livestream of state Sen. Wendy Davis filibustering Senate Bill 5, a bill that would ban all abortions after 20 weeks and put strict new regulations on abortion providers, forcing most clinics in Texas to close. The filibuster was briefly mentioned on evening newscasts but it was Twitter and the internet that kept the world informed into the night. The tweets came not just from citizens or protesters on the ground but also from local reporters who knew the Texas legislature and the people in it. Like the Boston Globe during the manhunt, The Texas Tribune and its reporters consistently provided solid information through Twitter and their liveblog. (It should also be noted that The Texas Tribune was founded by nonprofit sponsors and is cited in Out of the News as an example of strong nonprofit journalism.) As Davis’s filibuster was challenged and points of order and issues of germaneness piled up, local reporters tried to provide explanations while links to the Texas Senate rulebook were passed around on Twitter. No cable news cameras were there when, in protest to the halting of the filibuster, state Sen. Leticia Van de Putte (who had rushed back from her father’s funeral) did the parliamentary equivalent of dropping the mic, asking, “At what point must a female senator raise her hand or her voice to be recognized over her male colleagues in the room?” And no national news anchors were present to witness how that moment triggered 10 minutes of sustained yells and screams from the protesters filling the building- long enough to delay the vote on the bill. But that statement, and those yells, made their way across the internet in seconds, as local reporters and citizens tweeted, posted on Facebook, and clipped and shared on YouTube. News was happening whether the “mainstream media” acknowledged it or not. Once again we were depending on those on the ground for accurate information. The main ballroom of the National Press Club in Washington was an extraordinary place last Friday night, June 21, as the Society of Professional Journalists honored 84 reporters and editors in print, broadcast and online for excellence in journalism. I was thrilled to be among this distinguished group of 84. Out of the News was cited for excellence in media research. The message of event is similar to the message of my book: Despite enormous economic challenges, a lot of good journalism is being done throughout the country, and is serving democracy well. I can’t do justice to all the winners, but here are a few examples of stellar reporting, thinking and writing that won the coveted awards. David Fanning, who for decades has helmed PBS’s documentary series Frontline, had another winner in Big Sky, Big Money – by far the clearest and most definitive documentary I’ve seen that details the impact of relaxed campaign spending rules on democracy. Set in 2012 in Montana during the closely contested Senate race between Sen. Jon Tester and challenger Rep. Denny Rehberg, the documentary probes how out-of-state money changed the political landscape in that state, to the consternation of Democrats and Republicans alike. The documentary also demonstrates the growing collaboration among nonprofit media. PBS made the film in cooperation with the online investigative journalism site, ProPublica and American Public Media’s Marketplace. Another honor went to Jim Dwyer for a column on the unnecessary death of a 12-year-old boy from sepsis, an often lethal blood infection that, in this case, resulted from a cut. A big man in a light suit, Dwyer doesn’t look the epitome of Manhattan cool. Perhaps that reflects the humanity that imbues his metro columns for The New York Times. Dwyer deftly describes various facets of his city and its residents, telling beautifully written stories that often show the consequences of bureaucratic indifference or incompetence. His winning column detailed how Rory Staunton’s (age 12) symptoms were recognized too late both by his pediatrician and then by physicians at a New York hospital. Their inattention led to his death. The column paints a real-life portrait of an exceptional and thriving young man, while giving us an almost clinical report of the missed symptoms that robbed him of his life. What is masterful is Dwyer’s attention to detail and his ability to let the facts make his case. There is outrage here, but it is controlled. Recently, Washington Post media reporter Paul Farhi wrote a lengthy story on DC couples who work in media and politics. The story revealed one of this city’s not-so-well-kept secrets: In this town, the media literally are in bed with the government. Farhi’s piece outed some of those government-media duos – NPR’s Ari Shapiro is the spouse of Michael Gottlieb, on the staff of the White House Counsel. White House Press Secretary Jay Carney is married to ABC News’s Claire Shipman. Washington Post reporter Sari Horowitz is the wife of Health and Human Services General Counsel William B. Schultz. Vice President Biden’s communications director Shailagh Murray is married to Wall Street Journal political reporter Neil King. Farhi himself also coyly confesses, without naming names or specifying the nature of the relationship, that he sometimes writes about CBS news and is related to an employee at the network. Farhi’s critique focuses on how well these couples manage conflicts of interest. But that’s not really the problem. Reporters by and large do pretty well avoiding favoritism covering the news. They adjust assignments, and are pretty scrupulous about not covering any issue on which their loved ones have direct responsibility. The problem goes much deeper. It is the inbred Washington culture where big media and big government mingle in a seamless minuet that creates a plagiarism of the spirit. No, I don’t mean the plagiarism that happens when one reporter literally copies the words and opinions of others. This appropriation is much larger and more fundamental. The journalists who live and work together in the tight little cocoon of DC politics are seeing the world in the same way, chasing down the same fragments of news, and no one is challenging anybody’s assumptions. Think of it. The elite who comprise the Washington press corps — those reporters for major media outlets who cover the White House, the federal government and Congress and who are regular contributors to the weekly news shows — by and large are well paid and comfortable. High-profile reporters send their kids to the same private schools that also are attended by the children of senior government officials. They run into each other at the same parties. They live in the same neighborhoods. They dine at the same restaurants. None of this is wrong. But it is severely limiting. Journalists used to be working class stiffs, outsiders whose press passes would only get them pressed against the window of power, not inside the halls. They had empathy for the “little guy” because they emerged from the same class. Journalism was one of the few jobs around that required no formal college degree. To those who lacked the right pedigree or social skills, journalism rewarded hard work and cleverness with decent-paying jobs that were enjoyable and stimulating. As much as journalism might be in financial distress nationwide, the DC press corps still contains many reporters who’ve never taken a Greyhound bus or entered a Walmart. They don’t understand what it means to earn only the minimum wage. Last Wednesday I had the pleasure of giving a book talk at the Beatley Central Library in Alexandria, VA. I had a small, but very discerning audience. They listened intently to my talk, well supported by a creative power point designed by my daughter, Valerie. They asked terrific questions, and offered insightful comments about their views on journalism and its future. Topics ranged from the coverage of the Boston bombings to obsession with celebrity gossip, to how the 24-hour news cycle has changed journalism. I was struck by their concern about how a new generation of journalists would be equipped to help citizens discriminate between fact-based information and propaganda. 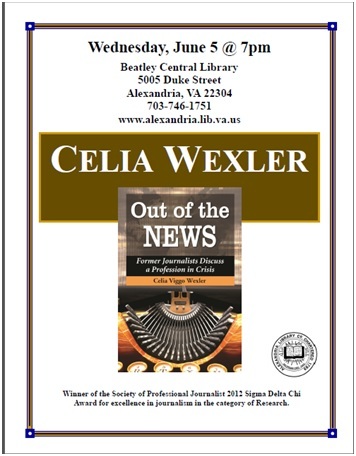 If you are in the Alexandria, VA area join me on Wednesday at the Beatley Library!